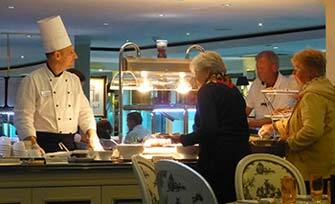 ABOVE: Executive chef Frédéric Roland presides over the lunch buffet in the Van Gogh Restaurant. Passengers on River Baroness take their meals in the Van Gogh Restaurant, a large dining room with picture windows overlooking the Seine. The restaurant has an "open seating" policy, and we never had a problem finding a place to sit at the mostly six- to eight-person tables. Coffee and pastries are available for early risers, and late sleepers can have breakfast in the Monet Lounge until 10 or 10:30 a.m. on most days. Lunch is also self-service, and in terms of sheer quantity, it's the most generous meal of the day. A typical lunch buffet might include salads, mini-burgers or grilled sandwiches, a pasta dish, a carved-to-order roast or ham, fish, vegetables, soup, and a choice of desserts. Dinner is served by waiters, with a different menu each night. On most evenings, the menu offers a choice of several appetizers and salads, two soups, four main courses (including one vegetarian dish), assorted cheeses, and two or more desserts. If the main courses on the menu aren't tempting, you can request a sirloin steak, free-range chicken breast, or salmon fillet. The Captain's Gala and Farewell Dinners have set menus, but even then, you have a choice of entrees, and you can request substitutes for any items that don't appeal to you. House wines, beer, soft drinks, water, iced or hot tea, and coffee (French press, espresso, or cappuccino) are complimentary at lunch and dinner. Oenophiles can order fancier wines by the bottle at extra cost. Tip: If you have special dietary requirements, let Uniworld know ahead of time, and identify yourself to the restaurant manager at the beginning of the cruise. The Monet Lounge is the bar and social center on River Baroness. It's a large room on the main deck with windows overlooking the river, comfortable chairs, tables, and a dance floor. At the entrance to the lounge, a beverage station offers free coffee, tea, ice water, and cookies throughout the day. You can order drinks from waiters or at the bar without charge, unless you want to splurge on premium spirits or wines. Afternoon tea--with finger sandwiches and pastries--is free of charge. Even if you aren't a tippler or a social butterfly, you'll want to visit the Monet Lounge before dinner each evening for the cruise manager's discussion of the next day's ports and shore excursions. The Monet Lounge also has live entertainment once or twice during every cruise. Upstairs, on the Sun Deck, you'll find a glass-enclosed Sky Lounge with tables and a tiled floor for dancing. No events were scheduled there during our cool-weather cruise, and it seemed to be used mostly by a couple of small groups who got together for card-playing, conversation, or--on one occasion--Bible study. A waiter brought drinks from the bar downstairs. Note: The Sky Lounge can be collapsed at the touch of a button when River Baroness needs to pass under low bridges. This happened only once during our cruise, when passengers were asked to leave the Sun Deck for safety reasons.